All Web addresses mentioned were functional as of 1-14-16. From the Cumberland Gap to the Atlantic Ocean, this is Virginia Water Radio for the week of January 18, 2016. This week, we use music by a Blacksburg, Va., singer-songwriter to help us dive underwater. Have a listen for about 55 sec. You’ve been listening to part of “Scuba Dive,” by Kat Mills, on the 2015 album “Silver,” from Sweetcut Music. Ms. Mills’ lyrics use the challenges and thrills of underwater diving as metaphors for exploration and trust in human relationships. While human interactions can be quite unpredictable, the main challenges of the underwater environment come from several predictable physical, chemical, and biological properties of deep water. Buoyancy—resulting from the density of a submerged object compared to the density of the surrounding water—must be adjusted for moving up or down. Movement is also affected by the frictional resistance of water, or drag. Water’s density also affects vision and hearing underwater. Pressure from the weight of the water affects a diver’s lungs, sinuses, and ears, as well as the levels of oxygen, nitrogen, and other gases dissolved in the water and in one’s blood. Temperature affects dissolved gases, too, along with presenting a body-heat challenge. Divers can become partially dehydrated through breathing dehumidified compressed air. And dangerous aquatic organisms may await. But adapting to those challenges through underwater breathing devices, other equipment, training, and experience allows divers to enjoy the exhilaration of feeling weightless, seeing fascinating creatures, and exploring worlds most humans never see. Add in trust and overcoming one’s fears, and it’s no wonder people continue to fall backwards into endless blue water, literally and figuratively. “Scuba Dive,” by Kat Mills, is from the 2015 album “Silver,” from Sweetcut Music; used with permission. More information about Kat Mills is available online at http://www.katmills.com/ and at https://www.facebook.com/katmillsmusic. 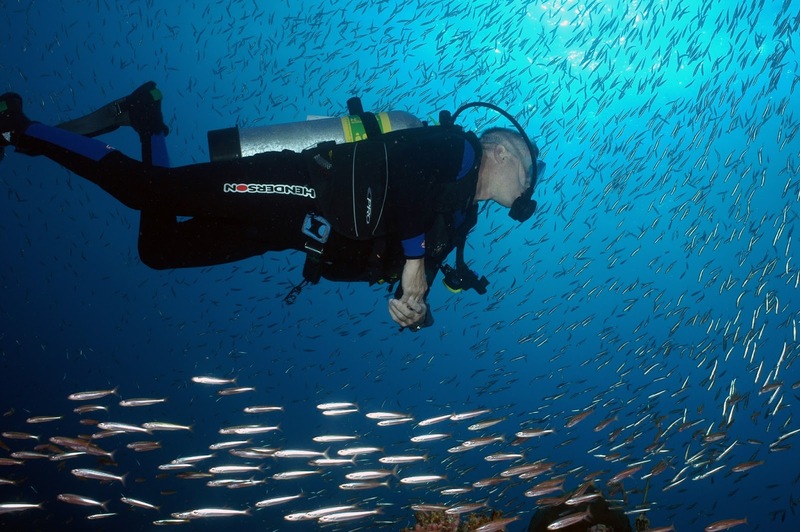 Scuba diver among a school of fish in Flower Garden Banks National Marine Sanctuary, Oct. 13, 2010. Photo by G.P. Schmahl, sanctuary superintendent, courtesy of the National Oceanic and Atmospheric Administration (NOAA) National Marine Sanctuaries Media Library, online at https://www.flickr.com/photos/51647007@N08/5077887899/. Dennis K. Graver, Scuba Diving (Second Edition), Human Kinetics, Champaign, Ill., 1999. TechDiveCenter, Blacksburg, Va., online at http://www.techdivecenter.com. U.S. Geological Survey (USGS) Water Science School, “Water Properties and Measurements,” online at http://water.usgs.gov/edu/waterproperties.html. Ice and dissolved oxygen – Episode 144, 1/14/13. 4.2 – characteristics and interactions of moving objects (including that moving objects have kinetic energy). 5.2 – sound creation, transmission, and use. LS.9 – organism adaptations to environments, including characteristics of land, marine, and freshwater environments. PS.8 – characteristics of sound waves, including technological applications of sound.